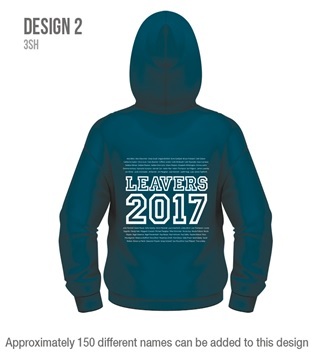 Design option 2 for leavers hoodies. The design consists of all the leavers names (approx. 150 names) above and below the leaving year date. A selection of colours (*see below) for the hoodie are available. Prices on application; discounts apply for larger orders. Turnaround will be between 14-21 days (from approval of artwork) and postage. If you would like to enquire about having a leaver hoodie please contact us.